CHADEMA presidential candidate, Edward Lowassa has said he is well prepared and organised to lead the nation as the Union government's fifth president. Lowassa also promised Mbeya residents to provide free education from kindergarten to university levels with just 1.4trn/- in collected revenue. He said the government has a lot of finances with several untapped revenue sources from natural resources. Lowassa, who leads the rainbow coalition better known as Ukawa said last year's tax exemptions amounted to 1.6trn/- which could be enough to finance the country's education budget. On employment the Chadema candidate who is supported by the Coalition of Peoples Constitution (Ukawa) said secondary school graduates will be deployed in the National Service whereby apart from patriotism the youths will be equipped with vocational skills. He made the pledges when addressing the full-packed campaign rally held at Rwanda-Nzovwe grounds a few kilometers from Mbeya city centre. 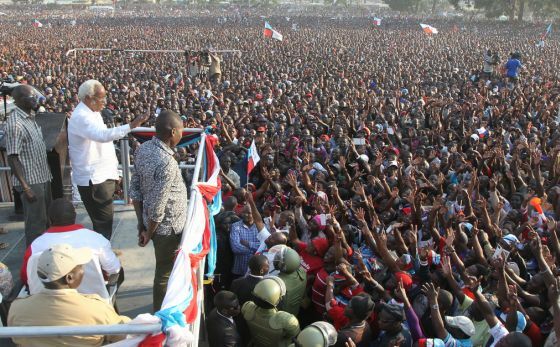 Before the rally, Lowassa addressed similar rallies in Chunya and Mbarali districts. He said the National Service capacity will be increased five times of the current size and capacity. He said farmers will be enabled to practice modern agriculture as well as to sell their produce outside the country. “I will form a common-man friendly government and establish a special bank for small scale entrepreneurs,” said Lowassa amid applause from the crowd. He however pledged to improve health services and upgrade regional hospitals to referral hospitals. Former prime minister Frederick Sumaye called upon residents to vote for the coalitions' candidate since the ruling party has failed to implement the promises it made to Tanzanians during the 2010 General Election. He said the current government has failed to improve social services specifically education and health. Sumaye, who was premier during the third phase period, noted that once voted into power, Lowassa will put a check on corruption and misuse of public funds as the two contribute to poor social services delivery. “Corruption is a critical problem ... Ukawa is determined and ready to control it for the betterment of Tanzanians,” Sumaye said. Chadema National Chairman Freeman Mbowe said he has no trust with the National Electoral Commission (NEC). He said Ukawa members will secure their votes by staying 200 meters from the polling stations. According to Mbowe, the fifth government will be formed by Chadema because wananchi have already decided to opt for change. He urged the police to implement their duties by adhering to work ethics and respect human rights before and after the elections. “Elections mean your life ... we only has seven days to go, you should not make a mistake you must vote for Lowassa," Mbowe said. Former CCM Chairman for Shinyanga Region, Khamis Mgeja urged the residents to weigh political parties by their election manifestos. According to Mgeja, CCM promised better life to Tanzanians but todate millions of people live under extreme poverty. He said Chadema will ensure better life for pastoralists, farmers, workers and other societal groups. Former Home Affairs minister Lawrence Masha said they made a brave decision to cross to Chadema. He insisted on the electorate to observe the country’s laws during the elections. Long time politician Kingunge Ngombale-Mwiru said the ruling party is about to split due to violation of its own constitution. He said CCM can longer rule the nation calling on the residents to vote for Chadema. “Chadema is very strong and determined to bring about change in the country... every citizen supports change,” said Ngombale-Mwiru, adding that he decided to leave the party even after serving it for 60 years.